This past June, my family and I were in Southern California on a week long vacation. Here's a link to a previous post featuring a quick summar. Our first night was in Hollywood. After dinner at Miceli's, I took a few minutes to walk around and explore a few blocks of Hollywood Boulevard. Above, the historic Hollywood First National Bank Building at the intersection of Hollywood Boulevard and Highland Avenue. Looking west on Hollywood Boulevard, with traffic stopped at the light. Tourists from Europe grabbing some quick photos during the traffic stop. To the right is the Hollywood & Highland entertainment complex. Across the street and to the west: this is in front of the First National Bank Building, featuring panhandlers, street merchants, and lots and lots of crowds. . I have no idea what in the world the guy in the foreground was selling. It felt like the leftovers from a garage sale. 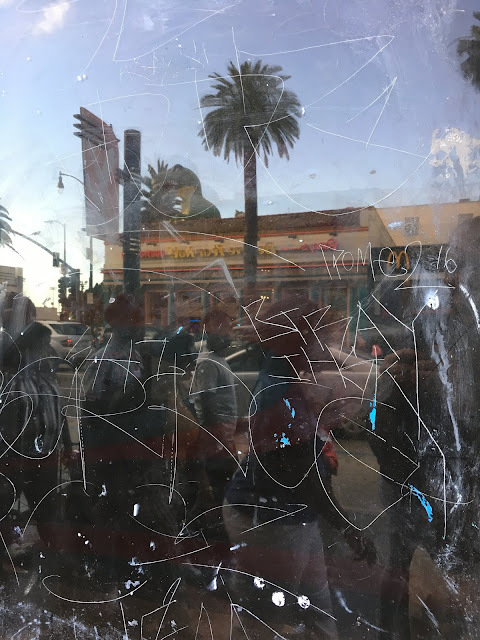 Reflections of Hollywood: the etched glass of empty ground floor of the First National Bank Building featuring more crowds, palm trees, and the kitchy "Ripley's Believe It or Not Museum." It's hard to believe that building of this size and at this location is empty. 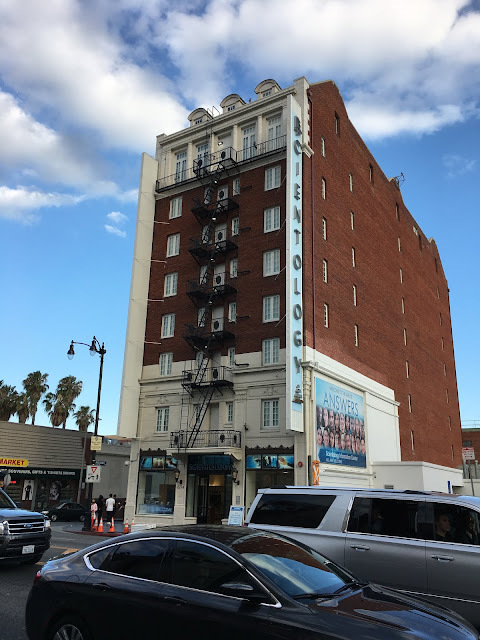 As rents in Los Angeles are some of the highest in the nation in the nation, it's too bad that downtown Los Angeles' 1999 Adaptive Reuse Ordinance can't be used here. Hollywood Boulevard, this time looking west. This was mid June 2017, when fidget spinners were all the rage, and at the height of their popularity. Why bother with setting up a table? This guys was just selling them out of grocery cart. This was yet another "under the radar" individual selling stuff on the street. 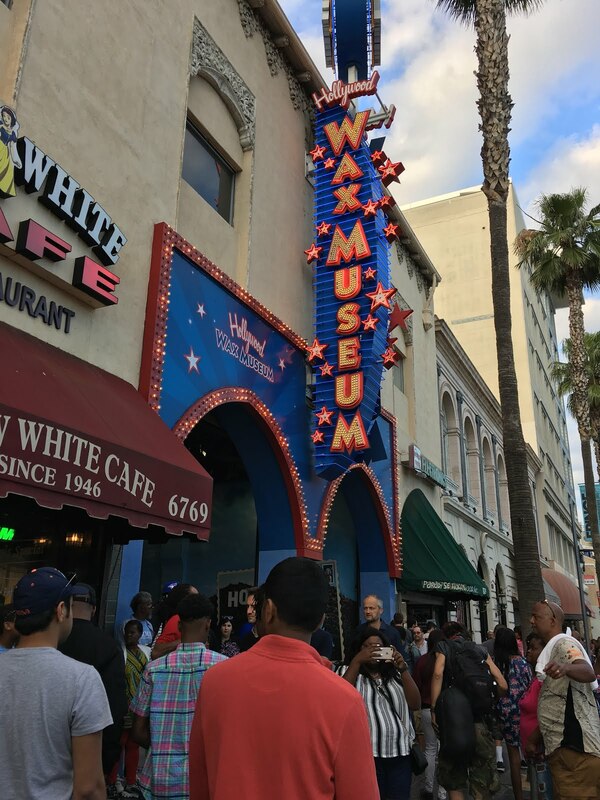 The ever popular Hollywood Wax Museum located at 6767 Hollywood Boulevard. For most visitors, this is the closest thing they'll get to seeing a celebrity. It's has been around since 1965 and, according to their website, the Hollywood Wax Museum is the longest-running wax museum in the United States. It's crazy, but apparently Hollywood is able to support two wax museums, both about a block apart. Madame Tussauds opened a similar wax museum next to Grauman's Chinese Theater in 2009. A few doors down is the Museum of Broken Relationships. At first I took this as a bit of a joke, but looking at their website, people who've visited have overall enjoyed it, describing it as "therapeutic." The original museum opened in Zagreb, Croatia in 2010. The Los Angeles branch opened in 2016. Seems like an appropriate location. 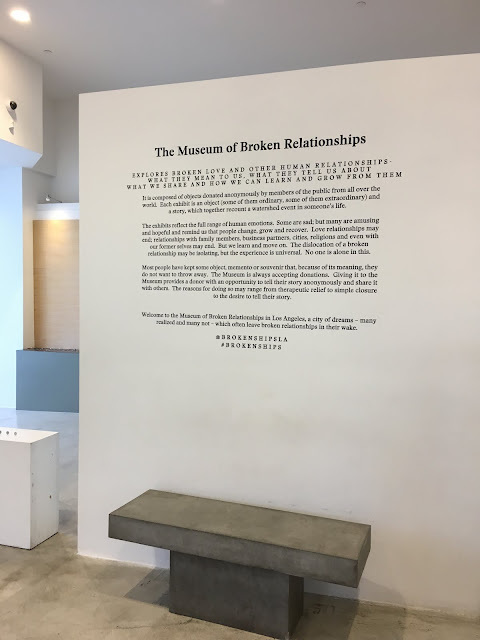 According to their website: "the Museum of Broken Relationships explores broken love and other human relationships – what they mean to us, what they tell us about what we share and how we can learn and grow from them. It is composed of objects donated anonymously by members of the public from all over the world. Each exhibit is an object (some of them ordinary, some of them extraordinary) and a story, which together recount a watershed event in someone’s life." I walked in just to check it out. There were a few visible displays, and a small gift shop. I didn't want to pay (admission is $18, $15 for students and seniors). Apparently, there's a 20% discount if you sign in via Yelp. The Yelp reviews are generally positive. On the other hand, the reviews for the Church of Scientology are anything but positive. This is their Information Center, located across the street. Their International offices are located a few blocks away and have over 805 reviews - most describing Scientology as a highly manipulative cult. One a scale of 1-5 (1 = lowest, 5 = highest) their average rating is 1. Please, please steer clear. 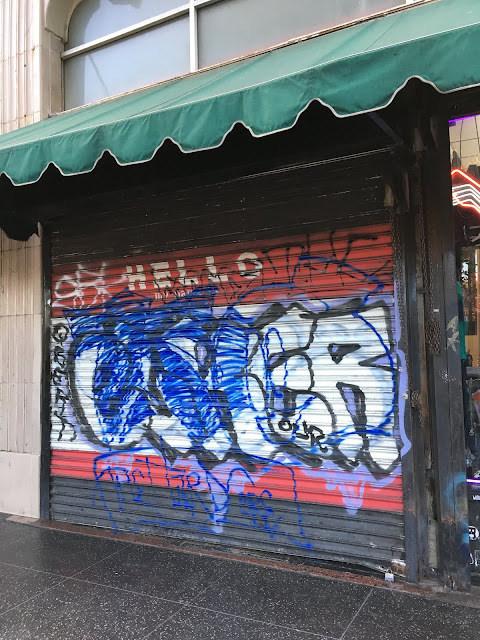 What comes as a jarring surprise to most tourists and visitors is how gritty much of Hollywood Boulevard (and Hollywood in general) feels. Most visitors are expecting a bit of glitz and glamour, if not movie stars. 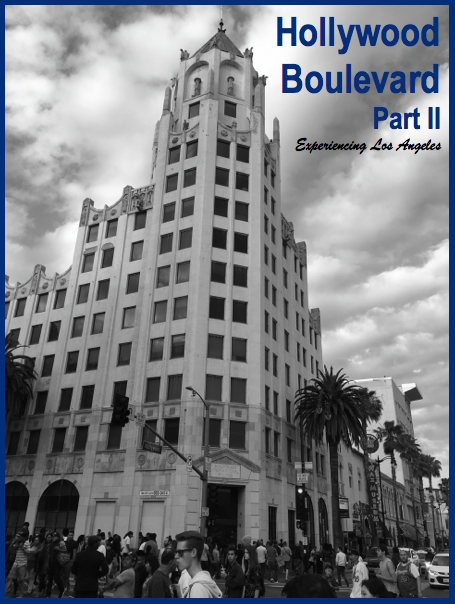 For the glitz and glamour, you'll have to head west - to West Hollywood or Beverly Hills. Both of which are separate, independent cities. Hollywood is actually a neighborhood within the city of Los Angeles. Meanwhile, if you're hoping to see a celebrity, you're much more likely in a community like Beverly Hills, Brentwood, Pacific Palisades, Santa Monica, or Malibu than in Hollywood. 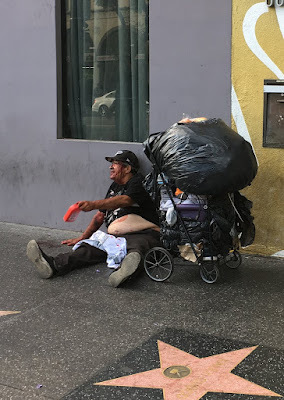 What Hollywood Boulevard does seem to have is plenty of panhandlers. The gentleman above may have a place to live, so I don't want to describe him as "homeless." He was, however, asking passersbyers for change. This guy was sitting on the street, with blood coming down from his head. Did he get beaten up? Robbed? I reaching for my phone to call 911 - when I realized he had just poured some fake "blood" on his head - just to get people's attention. I certainly felt duped, and a little angry. 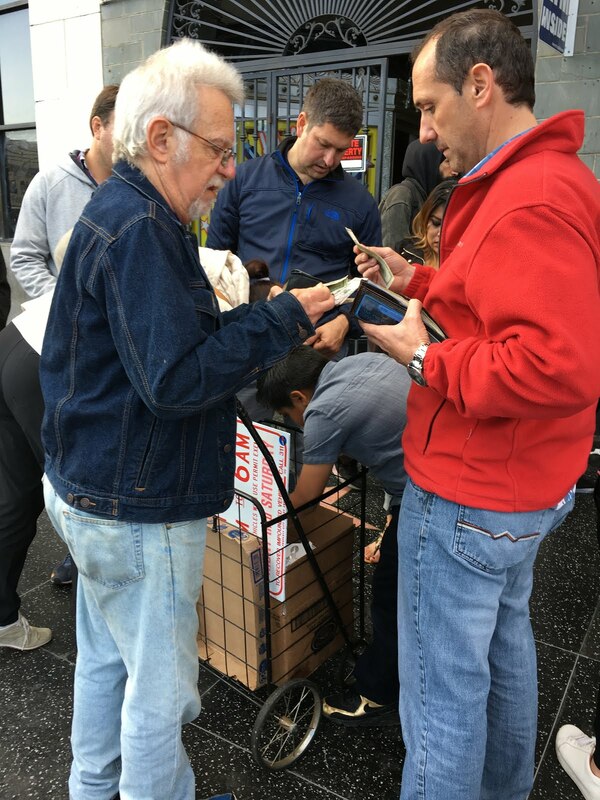 My family and I volunteer time locally with a couple of groups helping the homeless. In addition, we are committed to financially supporting organizations that work to get men and women off the street, help them get clean and sober, deal with mental health issues, and re-enter society. There are numerous organizations (both religious and non-religious) in the Los Angeles area, including the Union Rescue Mission, which has an outstanding long-term program to get people off the streets. 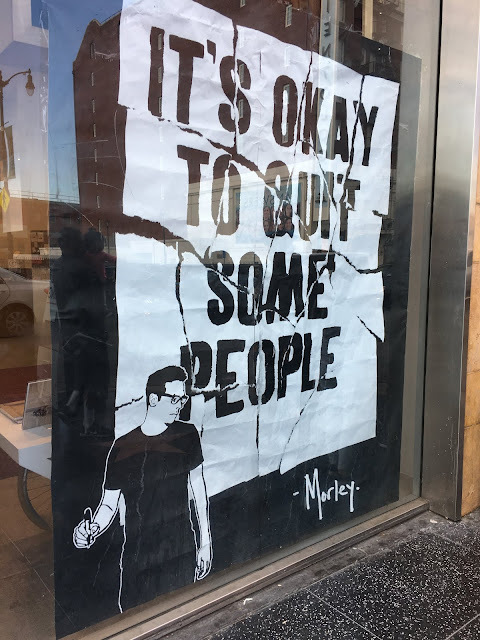 I have a close family member who struggled for years with addiction, so I speak (at least, somewhat) from personal experience. Utah, one of the most politically conservative states in the US, has reduced chronic homelessness by an incredible 91% through their "housing first" initiative. There's a desire to replicate something similar in Los Angeles, but the size, scope and cost certainly makes this challenging. Finally, here's an additional article describing how hard it is to keep those who do finally get permanent housing from going back to the streets. A few doors down, the now shuttered Vogue Super Club. The Super Club was a Hollywood nightclub that just didn't make it, closing in 2016. 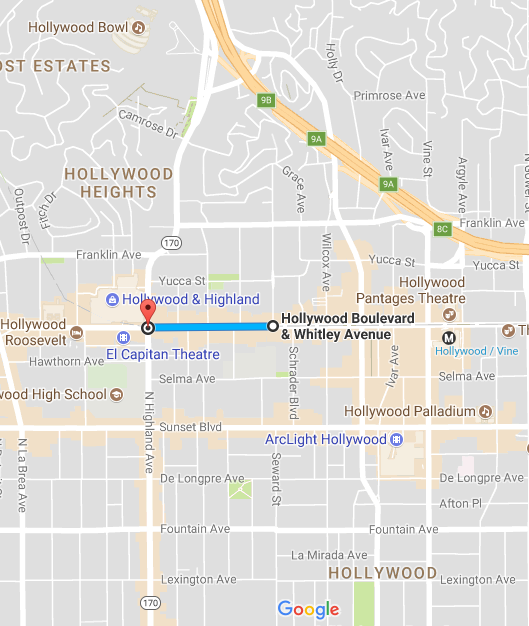 Here's a map of the the four short blocks of Hollywood Boulevard between Highland and Whitley Avenues - the area I was walking along.